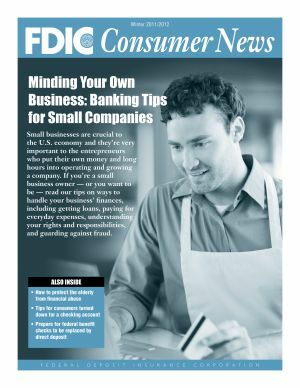 FDIC Consumer News is produced quarterly by the FDIC Office of Public Affairs in cooperation with other Divisions and Offices. It is intended to present information in a nontechnical way and is not intended to be a legal interpretation of FDIC or other government regulations and policies. Due to periodic changes in statutes and agency rules, always check the FDIC Web site — www.fdic.gov — for up-to-date information. Mention of a product, service or company does not constitute an endorsement. Small businesses are crucial to the U.S. economy and they're very important to the entrepreneurs who put their own money and long hours into operating and growing a company. If you're a small business owner – or you want to be – read our tips on ways to handle your business' finances, including getting loans, paying for everyday expenses, understanding your rights and responsibilities, and guarding against fraud. Original printing uses Pantone 549 and black on recycled, 70 lb., white, porcelain-silk text paper. This and other editions of FDIC Consumer News may be reprinted in whole or in part without advance permission. In addition, the FDIC offers this edition online in a PDF version (above) that looks just like the printed publication and can easily be reproduced in any quantity.